webCampusPLUS courses can also earn you our diploma, as well as potential credits recognized by our partners including Athabasca University, Brock University, the University of Manitoba, and Conestoga College. And what is the "PLUS" in webCampusPLUS? PLUS means you can now access courses from any device - smartphones, tablets and Apple products. PLUS means no more waiting for your certificates to arrive in the mail – your certificate is automatically generated the moment you complete the course requirements and available for you to print. PLUS means NO MORE waiting for a monthly course schedule. Once a course has been released, just enrol and have access to it immediately. webCampusPLUS is built on the Brightspace D2L online learning platform: a state-of-the-art online software used by some of the world’s leading teaching institutions like the University of Toronto, Athabasca University, and Ryerson University. And while these institutions can charge hundreds to thousands of dollars to take their online courses, webCampusPLUS courses are FREE for UFCW Canada members and their family members! Right now more than 40 of the all-time favourite webCampus courses have been upgraded to webCampusPLUS including Digital Photography, Ergonomics: Injuries, Risk Factors & Design Principles, Food & Nutrition Specialist, Pharmacy Assistant, and Safe Food Handling to name a few – with more courses being added every week. 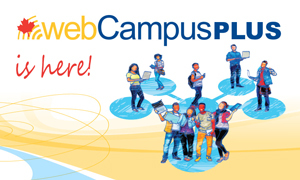 To find out more about webCampusPLUS, or to register, please visit www.ufcw.ca/webcampus.